CROWN HEIGHTS, Brooklyn -- Police said four more boys have been arrested for allegedly setting fire to a Jewish school bus in Brooklyn. According to the New York City Police Department, two of the boys are 14 years old, one is 12 and the fourth is 11. They were arrested Thursday, and charged as juveniles with arson and criminal mischief as a hate crime. An 11-year-old boy already was charged in connection with the Sunday evening blaze. 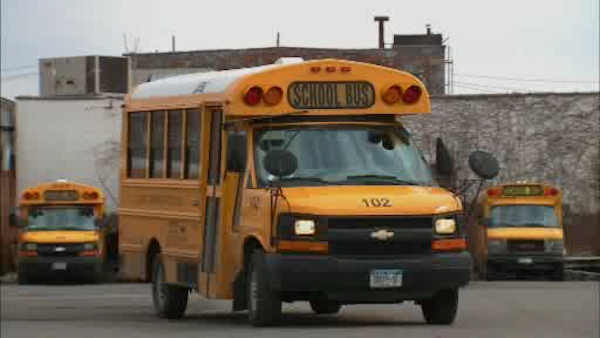 Police say surveillance video showed a group of boys running off the bus as it catches on fire. The bus belonged to the Bnos Chomesh Academy, a girls' high school in Brooklyn's Crown Heights. It's a neighborhood where tensions between the Jewish and black communities living side by side spurred riots in 1991.